In 2009, the powers that be solemnly made it known that the feasibility of funding the biannual Geraldine R. Dodge Poetry Festival was sketchy at best. Finances had dropped, and creative responses to a very depressing problem were needed. How like poetry to find a way to exist when predatory circumstances seem so collectively oppressive. It can even triumph over the number 13. Lovers of poetry united, sending bittersweet letters of support and gifts of greenbacks. Like freshly adolescent teenage boys would a well-developed classmate, several cities in New Jersey saw the festival’s relationship status change to single and started wooing its producers for the chance to host the festival’s thirteenth incarnation. Newark triumphed over all suiters however, and its winning pledge brought pleasures that were as unimagined as they will hopefully be sustaining. My own personal joys were the location itself, easily accessible via mass transit, and the diversity of presenting poets. Newark is Amiri Baraka’s hometown! He and several other A-listers – poet laureates Mark Strand, Kay Ryan, Rita Dove, and Billy Collins as well as heavy hitters Martin Espada, Bob Hicok, and Sharon Olds – were there and complemented by formidable international representation (Kwame Dawes, Dunya Mikhail, and Malena Morling) as well as younger poets such as Kyle Dargen, Michael Cirelli, Talaam Acey, and Jericho Brown. The latter are extremely important, not just because they are relatively younger than most performers featured in festivals past, but because they represent/use/write/live a form of poetry hitherto and unforgivably shunned by academia. These are poets whose writings need the acknowledged exposure in order to win over the minds, veins, and tear ducts of entrenched academics as well as attract those yet to be tainted/embittered by academia to this more accessible avenue of art. Not everyone was as happy as I was, however, with the move from country to city. The festival had moved recently once before, to Duke Farms, where despite several bouts of hay-fever and muddy soles, festival patrons bore no contempt towards their surroundings. It takes a special type of person to love a city, however, especially among those considered to be “typical” poets – call them tree-huggers, and they’ll most likely hug you in forgiveness for being so wooden. As far as I can see, the urban venue brought with it a taste of urban poetry, something much needed to shock the average (or at least stereotypical) attendee of the festival, and a better arrangement of venues. Sites for events seemed closer together than the waterloo tents, but that’s only to be expected. There were no open walls, preventing the carrying of sound and subsequently allowing for a denser space in which to hold a more diverse amount of sessions. Also, and on a very personal note, my arse doesn’t hurt nearly as bad as the last festival. That is to say that the seating in all venues was much more comfortable than that of the hard plastic chairs that dimpled Waterloo Village. Of course, that’s not to say I don’t have a soft spot or nature, but rather that, like poetry, venue doesn’t matter…only content does. Praise is also deserved by the ubiquitous ushers of the NJPAC as well as festival staff placed in church, museum, and hotel. Even to my reclusive self, they seemed warm and helpful 100% of the time and were everywhere you needed them to be, making transition betwixt venues very easy…especially given the extended time intervals between events. Concerning the matter of the festival, there was not a day without regret. I could only attend the weekend events, and there were so many poets I wanted to hear. Alas, the panels and discussions were too absorbing, the guests far too entrancing, to inspire thoughts of adultery. Even the Main Tent, I mean Main Stage, readings seemed infinitely more engrossing than in festivals of old. Specifically, I will point out Sunday’s tribute to Lucille Clifton, whom I missed with all my heart this festival. A standing ovation with raucous and relentless applause brought up many a choked-back tear and reddened my eyes not only for her absence, but in honour of all she’s made so many people feel. 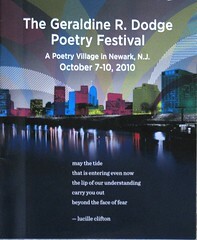 Such was the continuance/resurrection of the Geraldine R. Dodge Festival. If they’re wise, even if the event moves from Newark to places less urban, the producers of this grand celebration of poetry, indeed humanity, will not forget to include those that they recognized with this most recent incarnation. While I definitely agree tact was not on Amiri’s agenda (except his cool and subdued “Later, Lucille” at the last set of main stage readings) and that he does indeed seem a rambling wild man of late, I’d say that he has a right to recite whatever he feels like (as do we all). I also agree that the standing ovation was overboard and undeserved for the poem, but the applause for his indomitable spirit is something I think all poets should be able to get behind. Of course, it’s impossible to tell exactly why individual were clapping, so until individuals’ reasons are known, I’d reserve judgement on those who stood or clapped. This was a festival of resistance, after all, seeing as it fought its own way back into existence against the odds poetry faces in any economy let alone a horrible one. Don’t let one poet or people’s reaction to him/her ruin a celebration of poetry. Masses will fall for just about any charismatic character despite their actual talents. I walked out before Bill Collins took the stage and didn’t attend any panel featuring him for that same reason…sounds like you should have done the same for Amiri in order to enjoy any number of the other fantastic events the festival had to offer.